Lighthouse is one of the top muck diving sites in Cabilao with chances of spotting pipefish and nudibranchs. At Lighthouse you will find a wide slope with sandy bottom and a seagrass meadow, with some coral formations. This dive site slopes down from shore to a depth of about 20 m. It is one of the best muck diving spots Cabilao has to offer. In this area, photographers and divers will find a wide variety of life: Sea snakes, Crocodile snake eels, Devilfish, Stonefish, Leaf fish, Harlequin shrimps, Stargazers seagrass- and Harlequin ghost pipefish, Seamoths, Mantis shrimps and an astonishing variety of nudibranchs. Occasionally, Eagle rays, Turtles, Octopi and File clams can be spotted. 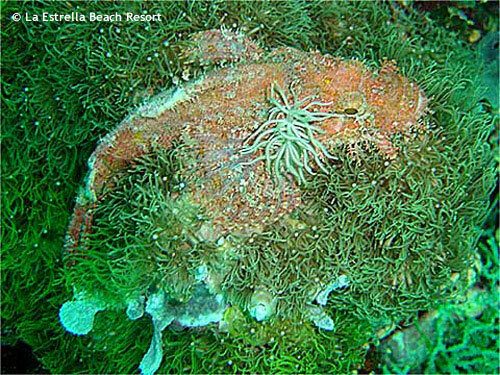 This dive site makes for an easy shore dive and is also appropriate for beginners. You will find perfect conditions during high tide, when the slope is at the lee of the current. Do not forget to make time for a night dive! Dive with us and explore some of the best dive sites in the Philippines. Located on Alona Beach, Panglao Island, Bohol, GENESIS DIVERS are offering daily dive trips, accommodation (Hayahay Resort), dive safaris, the full range of PADI courses and travel information.